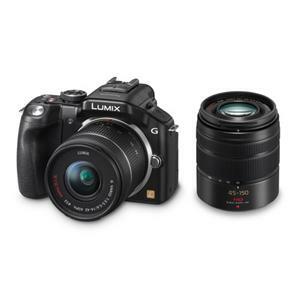 This review of the Lumix DMC-G5 especially for Digital Photo School, is by Barrie Smith, an experienced writer/photographer currently published in Australian Macworld, Auscam and other magazines in Australia and overseas. It’s easy to see that mirrorless cameras have swamped the market, with models from Panasonic, Sony, Pentax, Olympus — even Canon! — and others, kicking the heels of the budget DSLRs. Buyers like the small size, ease of use and access to a range of high quality lenses; in the case of this camera, you can slip on Leica’s well-regarded optics (with an adaptor) as well as those produced by Olympus, Voigtlander (Cosina), Carl Zeiss, Schneider and Sigma. So it was with barely concealed delight that I took hold of the DMC-G5, successor to the G3 model. This twin lens kit is exclusive to Jessops and includes a Panasonic 14-42mm standard / wide zoom lens and a Panasonic 40-150mm telephoto zoom lens. Evolving from the very successful DMC-G3, the compact and smartly styled DMC-G5 builds on that model’s successes and adds extra functionality, higher shooting speed and touchscreen operation, together with an extremely high resolution viewfinder.